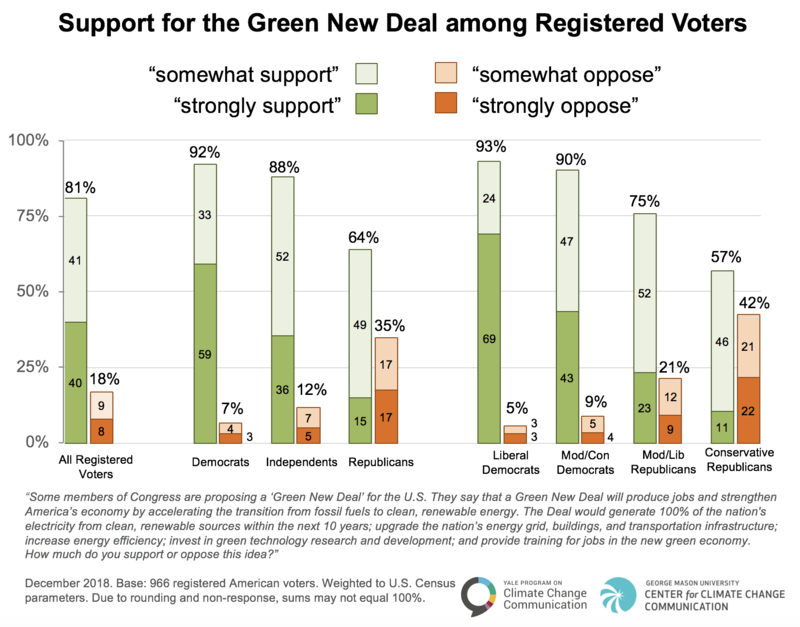 Yale Program on Climate Change survey of support for the Green New Deal. It was yet one more in the seemingly unending string of public episodes pitting a Republican politician against scientists on man-made climate change. Last month, Texas Gov. Greg Abbott, who as attorney general had attacked climate science and fought Obama-era measures to counter climate-disrupting pollution, dodged a reporter’s question about whether he now thinks climate change helped cause Texas weather disasters in recent years. We, the undersigned, are climate scientists and experts, and can report to you that climate change is happening, it is primarily caused by humans, and it is having a devastating impact on Texas, including increasing deadly flooding resulting from Hurricane Harvey. TCN occasionally rounds up recent polling data to provide an updated look at shifting public views of climate change. The exchange between the Texas governor and the Texas scientists offers a fitting occasion to do that again. Taken together, several recent national surveys by different polling organizations indicate public opinion continues to move in the scientists’ direction as opposed to Abbott’s currently noncommittal “I’m not a scientist” stance and record of opposing climate action. A pair of polls released in mid-December illustrate the point. An NBC News/Wall Street Journal survey found 66 percent of Americans declaring there is now enough evidence to warrant action against climate change. That number is up from 51 percent in the same poll two decades ago. Forty-five percent wanted “immediate action,” nearly double the number (23 percent) who said that in 2009. Republicans were the only group opposing action in the latest NBC/Journal survey, with 56 percent saying concern about climate change isn’t justified or more research is needed before taking steps to limit it. 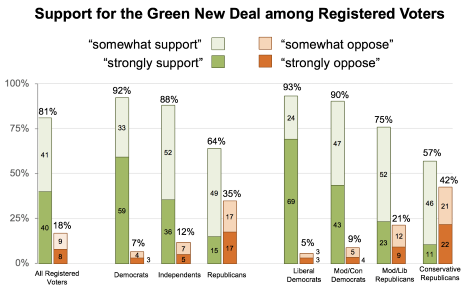 It was noteworthy, then, that another national poll released in December, this one conducted by the Yale Program on Climate Change Communication, found Republicans joining other Americans in backing the Green New Deal concept promoted by progressive Democrats in recent months. The Green New Deal includes producing all of the nation’s electricity from clean, renewable sources within 10 years; upgrading the energy grid, buildings and transportation system; boosting energy efficiency; investing in green technology research; and offering job training for new jobs in an envisioned green economy. Overall, 81 percent told the Yale pollsters they supported this concept “strongly” or “somewhat,” including 92 percent of Democrats, 88 percent of Independents and 64 percent of Republicans. The latter number included 57 percent of conservative Republicans. Republican support may seem puzzling, given stances like Abbott’s among many Republican office-holders and polls continuing to find a persistent partisan divide on climate between Democrats and Independents on one side and Republicans on the other. Notably, although our description of the Deal accurately provided details about the proposal, it did not mention that the Green New Deal is championed by Democratic members of Congress such as Alexandria Ocasio-Cortez [of New York] and John Lewis [of Georgia]. Other research has shown that people evaluate policies more negatively when they are told it is backed by politicians from an opposing political party. Conversely, people evaluate the same policy more positively when told it is backed by politicians from their own party. A survey by the Monmouth University Polling Institute, released in November, found the number of Republicans acknowledging that climate change is happening had risen from 49 percent three years ago to 64 percent. The poll found that 78 percent of all Americans agreed the changing climate is causing things like more extreme weather events and sea-level rise – an increase from 70 percent who said that in 2015. The Monmouth researchers found growing agreement across the partisan spectrum about the significance of climate-change threats. Eight-two percent of Democrats, 51 percent of Independents and 25 percent of Republicans said they regard climate change as a “very serious problem,” up from 63 percent, 42 percent and 18 percent respectively three years earlier. Meanwhile, results of a couple of additional national polls released in December signaled the erosion of another refrain of Republican officials and their allies against climate science and climate-change-fighting actions that the science points toward. Essentially, this Republican claim of recent years, complementing the “I’m not a scientist” line, admits that the earth’s climate is certainly changing but adds that it has always changed and that there’s no reason, or not enough evidence, to say human beings are the cause this time. This argument runs directly counter to the sweeping consensus of climate scientists worldwide regarding the impact of heat-trapping pollution from the use of coal, oil and natural gas. Even with such forceful statements from the scientific community, however, American public opinion has tended to side with the view that humans aren’t the main cause or that the expert jury is still out on the question. The two December polls show a shift toward science, however. A survey by Politico and Morning Consult found that 58 percent of voters say climate change is the result of human activity, with only 30 percent saying it’s a natural phenomenon. Almost identically, 57 percent told Reuters/Ipsos researchers they think climate change is wholly or mainly due to human activity. That number represented a jump from 2012, when a poll by Reuters/Ipsos found 47 percent agreed with the scientific consensus that humans are causing climate change. As on other subjects in the polls, a major, lingering partisan divide was evident on the causation question. In the Politico/Morning Consult survey, majorities of Democrats (78 percent) and Independents (58 percent) said humans are causing climate change, while only a third of Republicans (34 percent) accepted the scientific consensus that this is the case.